With the recent launch of AMD’s Radeon 400 series parts and consequent focus on hardware, it’s been some time now since we’ve heard from AMD about their Gaming Evolved application. As it turns out, there’s a reason for this. Thanks to some digging by the crew over at WCCFtech, it turns out that AMD discontinued the application last month and will no longer be distributing or supporting it. The Gaming Evolved App was back in 2013 as part of the Radeon 200 series launch. The utility launched as a settings optimization service, which in a departure from other efforts, relied on crowdsourced data to generate settings recommendations rather than AMD running centralized testing. Though never explicitly called so by AMD, the client was clearly their answer to NVIDIA’s GeForce Experience, offering an AMD take on settings optimizations, video recording, and the like. 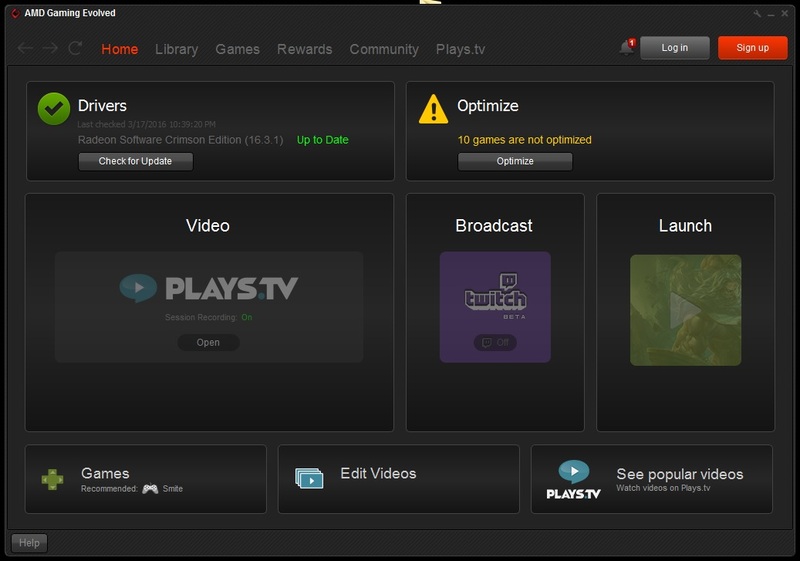 Though branded as an AMD application, the utility was in practice a second-party initiative of sorts, and at its core it was a customized version of the Raptr’s eponymous gaming utility. The most recent major update to the Gaming Evolved App was in March of this year, when AMD & Raptr added additional video recording and editing functionality. But after 3 years, it would seem that AMD has decided to discontinue the client for reasons unknown. After noticing that the client was no longer being bundled with the latest drivers, WCCFtech reached out to AMD, who provided the following statement. Starting September 12th 2016, AMD is no longer bundling the “AMD Gaming Evolved App” by Raptr with builds of Radeon Software. The application will still work. AMD will cease to undertake any compatibility testing, install support or general technical support for this application, nor will it be available through Radeon Software or its installer. Previous builds of Radeon Software that include the “AMD Gaming Evolved App” dated before September 12th 2016 will remain intact and will not be affected. At this point AMD is not bundling a similar application with their drivers, nor do their drivers contain equivalent settings/recording functionality. So at least for the time being it’s fair to say that AMD no longer has a counterpart to GeForce Experience. That said, the Gaming Evolved App wasn’t a 1st party effort and its continued existence was never assured, but it is admittedly rare to see a software feature/package dropped in this manner. Actually Cludgy is spelled Klugy. ...and Anand is Bullshyte for not telling you the Gaming Evolved is a DX11 App. And DX11 is DEAD.